Brazil may not be "totally ready" for the start of the 2014 World Cup because of building delays, admits Fifa secretary general Jerome Valcke. Two stadiums - in Porto Alegre and Sao Paulo - are still not finished, with the tournament due to start on 12 June. Valcke insisted there is "no way" that fixtures will be postponed. "If you want me to summarise, we are not ready," said the Frenchman. "We have two stadiums where there is still work to do." Preparations for the World Cup have been beset by problems. 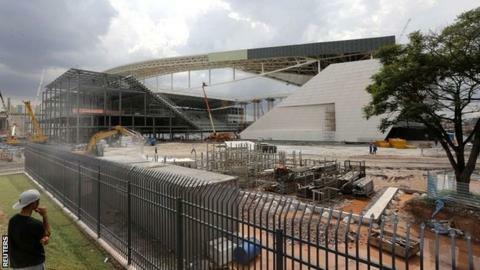 A construction worker fell to his death last week at Sao Paulo's Arena Corinthians, which is due to host the opening match between Brazil and Croatia. That took the number of fatalities at the site to three after two people died in November following a partial collapse of the stadium. A total of eight men have already died working on World Cup stadiums. Porto Alegre's local mayor had said the city may drop out if additional funding was not found to build facilities for media, sponsors and fans. The city's Beira Rio stadium is due to host five matches during the tournament. But Valcke, who visited Brazil last week, insisted finance was available. "Maybe there will be things which will not be totally ready at the beginning of the World Cup, but the most important thing for the 32 teams is the training camp and fields," he added. "All of this will be there to ensure you have football."